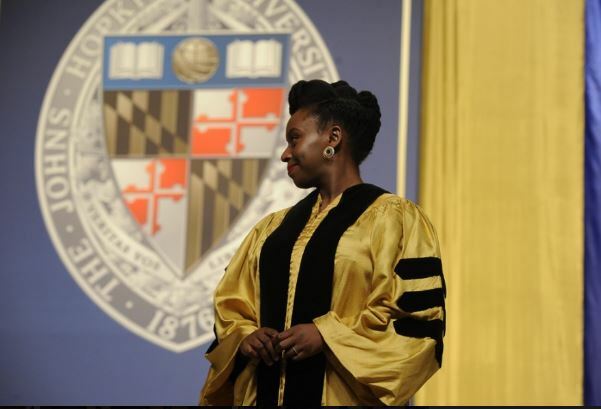 Internationally-acclaimed author Chimamanda Ngozi Adichie received an honorary degree from the Johns Hopkins University on Wednesday May 18th 2016 at the universitywide commencement ceremony at Royal Farms Arena. She gave such profound advice to graduating seniors “Eat real food as often as you can. And embrace ignorance. Say those words ‘I don’t know’. Because by embracing ignorance you open up the possibility of knowledge”. She was honoured along with Pioneering academic and philanthropic leader Judith Rodin, Nobel prize winning neuroscientist Dr. Richard Axel, Philanthropist and retired judge, Honorable Ellen Heller, Renowned researcher Susan Baker, Eminent attorney and philanthropist Shale Stiller, Esteemed researcher Laurie Zabin. How Haven Homes’ Ufuoma combines Wedding Planning With Hectic Work Schedule…It’s a Must Read! Now that’s one Nigerian that makes us proud. Apart from her sometimes unnecessary claim to Feminism, I think she is one of the greatest Nigerian writer at the moment. BN, it’s “Johns Hopkins” not “John Hopkins.” It’s a common mistake though =) Anyway, congratulations to the brilliant Chimamanda! She has? When? I’m so excited! I saw her pregnant photos circulating but I didn’t hear of any baby or congratulatory messages. I thought the worst has happened. Are you sure? Boy or girl? Mehn Congrats Chi, if you’ve given birth. You make every Nigerian home and abroad proud. Your child would make you prouder than you’ve made your parents. We love you. God bless your home and career. Johns Hopkins honorary degree is a tip of the ice beg. Bigger ups to you! I wish my nieces would pick you as their role model instead of Kylie abi kylan Jenny. Chai! I have no girl but you make me long for one. With your natural hair and beauty. Chai! I love you scarrra. I Wish I can write well, I would have entered that writing competition just to see the glory of God(you). I will never stop praying for you.God bless you. 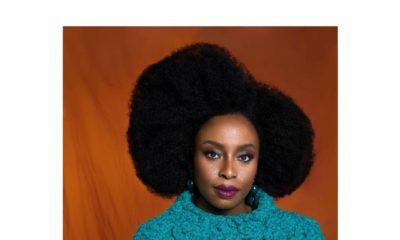 Chimamanda’s hair in that photo … gorgeous. Great honour for her and other worthy men and women chosen (I liked all their nuggets of advice… no be only graduates need am). P.S. I’m endlessly fascinated at the chasm of difference seen in how oyibos treat the younger generation… It’s always with a sense of “Go, you whippersnapper, you! The world is your oyster so come and let me generously pour these nuggets of wisdom into your life, then I shall sit back and watch you soar”. The contrast always amazes me. you sound a bit bitter and cynical. So what if she no born, thank God she has, if you read, you’ll see 🙂 Nigerians are so bitter I swear. Friday and Sunday now they’ll litter up their places of worship and be shouting. 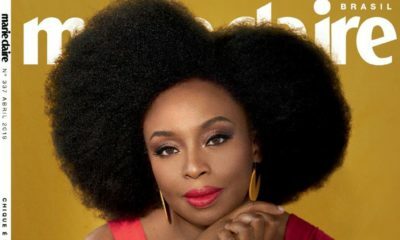 Congratulations to Chimamanda. One great woman I admire. BN it’s Johns Hopkins not John Hopkins . 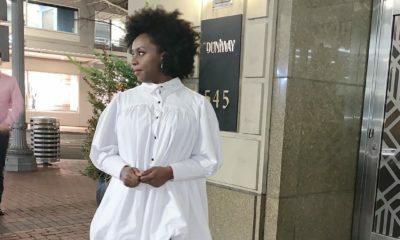 Chimamanda is the one Nigerian youths should be following and listening to. Not empty, loud-mouth hustlers like Omojuwa, Chude or Deborah Williams. Those ones lack SUBSTANCE. They only latched on a Nigeria’s gullibility with good packaging. Are you me? Cos u just spoke my language. Moral wise she may not be the best,a woman that denied the husband and insisted on been called the mothers name,I will take omojuwa over her any day. She can choose to be called what she wants, She was a woman, whole and awesome before the man married, it doesn’t change how she loves or respects him as her husband, Ya’ll will be carrying culture on your head as if culture has ever fed you, She is a phenomenal woman, Celebrate her for that!!!! Sit tight because you’re about to get schooled. 1. Any human being has the right to be called whatever they desire. If Chimmamanda and her partner have agreed that she will keep her maiden name, who are you or any half-baked journalist to correct her and insist that she goes by her husband’s name? Did they consult you? Are you their father? Are you their god? Leave mature adults in their 30-s be. Let them be. 2. You sound extremely shallow is you say that because she refused to be called by her husband’s name, and decided to be called by her father’s name, then she’s “not the best.” She is not putting out her morals, or her personal values at the altar of your opinion. She’s putting out her fiction. So it’s a big shame when you don’t see the quality of the work she’s creating, because you’re blinded by her PERSONAL business that does NOT concern you. 3. What do you know about her morals? Because she insisted on retaining her maiden name, she’s “not the best?” Please. Give me a break. She never asked for your advice on her morals, neither does she need it. Whether she’s moral or amoral, she’s good to go once she’s living within the legal confines. It’s because of people like you that human beings do not progress. You have successfully attempted to throw out the baby with the bath water. Instead of celebrating a WORLD RENOWNED writer, that’s putting Nigeria on the world map for good things, you’re here spewing uselessness. Do yourself a favor and read at least one of her books. Educate yourself, you owe that to you. What substance has Omojuwa got? Academically or even professionally besides making noise for politI Ian’s? What is immoral about refusing to bear one’side husband’s name? So oyinbo culture of bearing one’side husband’s name has now turned to a morality code for Africans..smh. For your information, it is even unIslamic for a muslim woman to dump her maiden name for her marital name. That you would take a nonentity, noise-maker Omojuwa over Chimamanda does not only reflect your personal shallowness but it also indicates the pitiable situation of the average Nigerian youth. @ Letty hey dear ! Vanity Fair recently did a feature on her, post partum, in which she was photographed by her husband (who takes a lot of her pictures). Yup, we feminists find love (and Jesus) too and have blessed marriages with real life Nigerian men. I don’t like her,not a fan of her feminism agenda and i don’t like women like her (over ambitious women).I have no respect for such women.I pity whoever allows her/his daughter to pick this woman as their role model.She’s nothing but a hypocrite that are teaching women to disrespect men as men with her rubbish feminism. Over ambitious? i bet you are one of those men who would prefer to have women whose sole goal is to please the man, groveling at their feet. Unfortunate is the woman who marries you.. I weep for your wife/ wives, mother, sister, aunties. … in fact every woman in your life! Always nice to hear/ read great news about Nigeria, home and abroad! This ridiculous! People like you are the reason feminism thrives. You have no respect for “over ambitious women?” I can’t believe you! I was brought up by an “over ambitious mother” with very little money who defied all odds to educate ALL her children, some of us to the masters level. I celebrate and respect ambitious women because I was raised by one. I was raised by a fearless and strong woman and it has made me a better person. Chimamanda, like my mum is a perfect example of how important it is to be “over ambitious”. I hope and pray that nobody I know ends up with you. Really confused!! Did the husband complain ? And which Omajuwa? The Twitter Orubebe one? No offense biko, just want to know your state of mind. That’s why you are who you are and the rest of the world who celebrate her are who they are. Who cares if you would take Omojuwa over her any day? Ok the 82 or more likes ba? Congratulations, on this new honour. Congratulations on the birth of your child. What a lucky little girl to have such a role model for a mum wow! Congratulations. HUH,TEE YOU GET SENSE SO??? AND WHOS THE 82 WEIRDOS THAT LIKED YOUR COMMENTS? Amaze balls!!!! Congrats & way to U #PROUDLYNIGERIAN# 🙂 I love this University die ( one of my favt for med field) but their weather is no JOKE in the winter. Congratulations Miss Adichie,flying the Nigerian flag high abroad and at home.. I would have loved to receive an honorary doctorate too(lol),as opposed to studying,research work,thesis writing,sleepless nights etc to get it…. Congrats Chimamanda, keep making us proud. Your mother that is claiming your father’s name, what has she ever accomplished. Common congratulations you cannot say. Idiot. Chimamanda is awesome and Yes ‘ her claim to feminism’ as some rando put it, is what makes her more admirable. Just finished one of her books, ‘ the thing around your neck’. Chief, this woman’s success in all areas must really be giving you sleepless nights and the funny thing is she keeps winning while you remain on the same level, stalking all the posts about her and expressing your venom. It always makes me laugh when ordinary men who are not achieving much open their loud mouth and say they do not have respect for certain women. I ask you chief, who your respect don epp? Chimamanda is winning, slaying and getting better in every way. She’s an illustrious daughter, a world acclaimed writer, a beautiful black woman who has a man who adores the very air she breathes and God has blessed her with a beautiful angel.. Chief, what does she need your respect for? pray tell. Shout out to all the overambitious women!!!! Keep on slaying!!!! The world is your oyster!!!! Congratulations my Darling sister. You will continue to soar high. Congrats @ Adichie. Looking forward to reading AMERICANA. Carry go!!! !